The active surface of the dressing is coated with a cross-linked adhesive mass containing a dispersion of gelatin, pectin and carboxy-methylcellulose together with other polymers and adhesives forming a flexible wafer. In contact with wound exudate, the polysaccharides and other polymers absorb water and swell, forming a gel which is held within the structure of the adhesive matrix. The moist conditions produced under the dressing are intended to promote fibrinolysis, angiogenesis and wound healing, without causing softening and breaking down of tissue. The gel which is formed as a result of the absorption of wound exudate is not mobile and free running but held within the structure of the adhesive matrix. 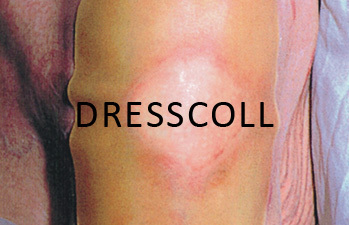 Most hydrocolloid dressings are waterproof, allowing normal washing and bathing. Incifilm® Incise Drape is a transparent, adhesive polyurethane film which allows the skin to breathe, so preventing moisture build-up under the drape, as a result, it adheres to the surrounding skin throughout long surgical operations and more importantly, right up to the wound edge. Incise drape is a transparent adhesive polyurethane fllm which adheres right upto wound edge. Incifilm Iodine Incise Drape is a yellowish colored, transparent, adhesive Polyurethare film which allows the skin to breath. So preventing moisture build-up under the drape. As a result adheres to the surrounding skin throughout long surgical operations and more importantly, right up to the wound edge. Incifilm Incise Drape adhesive, being iodine impregnated, provides continuous, broad spectrum antimicrobial activity, and a superior adhesion to the skin and wound edge. Adheres right up to wound edge. Each Incifilm® Incise Drape is E.O gas Sterilized and individually wrapped in peelable pouch. Bacteria proof, virus proof and waterproof film. Adheres right up to wound edge - The drape will provide protection from laterally migrating bacteria, because it stays in place even throughout major operations involving prolonged retraction of wound edges. Broad spectrum antimicrobial activity - Iodine impregnated adhesive shows antimicrobial activity. Thin but extremely strong - Incifilm® incise Drape is tear resistant, but can be cleanly cut with a scalpel. Conformable and elastic - Incifilm® Incise Drape is very conformable on operation sites, its elastic qualities make it suitable for use where heavy manipulative surgery is involved, for example, in total hip replacement. 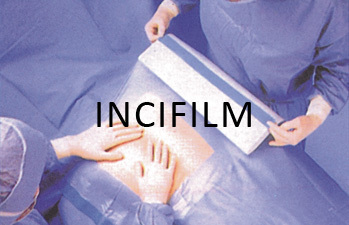 Maintains a sterile operation site - Incifilm® Incise Drape provides a sterile working field, onto which internal organs may be placed without fear of contamination.